Imagine having a beautiful concrete floor that flows seamlessly from your interior floors and outside to your entertainment area. If you love the look of a contemporary, designer floor that is hard wearing and can match into your interior spaces, then talk to the team at McGinn Concrete about the versatile honed and sealed concrete finish. 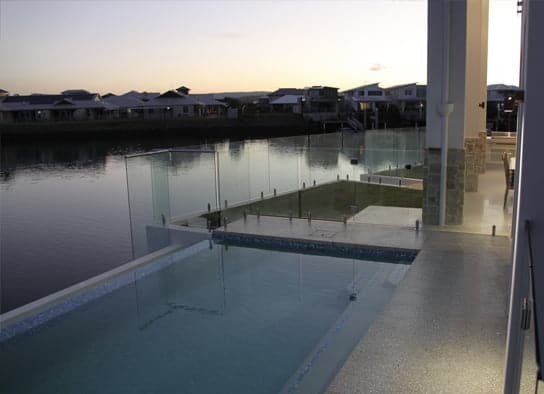 Honed and Sealed Concrete is best suited to outdoor areas, paths, driveways and pool surrounds where a non slip finish is required. The main difference compared to the HiPERFLOOR™ is that we only grind to 60 Grit for exterior use and if a Honed & Sealed finish is required for an interior we would grind to 120 Grit, this compares to the many thousands of grit that we use when creating a HiPERFLOOR™. The other main difference is that the floor is sealed once the grinding process is finished. For exterior finished Honed and Sealed Concrete we recommend using ACS Street Scape Seal WB which is a water based environmentally friendly Silane penetrating sealer specifically designed to meet the requirements of the Green Building Control of Australia’s “Green Star” building code. Treated surfaces are effectively protected from the ingress of water based, oil and organic stains. For interior Honed & Sealed Concrete we grind to 120 Grit and grout the surface to improve the overall shine of the floor. We recommend using 2 base coats of IBS LD1000 acrylic water based sealer to enhance the colours within the floor, we then apply 3 coats of IBS stainless acrylic water based sealer which prevents any stain penetration, to finish the floor we then add 3 coats of high gloss IBS premier sealer thus giving the floor a high shine. McGinn Concrete recommends honed concrete, a slip resistant concrete finish, for not only entertaining areas but your patios, around the pool or even on driveways. 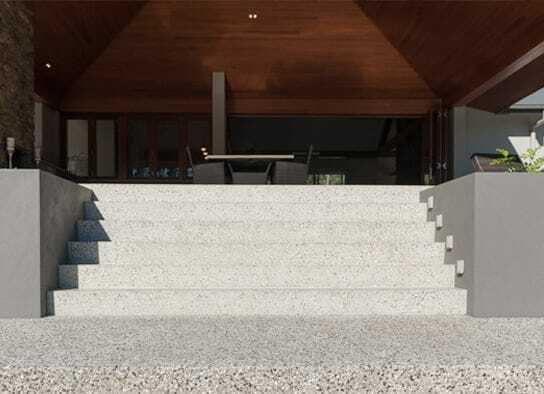 Because McGinn honed concrete is ground to a course cut allowing for slip resistance this concrete finish is also suitable for industrial and commercial use, for walkways, commercial foyers, and all public access areas. Contact McGinn Concrete for more information or for a free quote on your project.